I had the opportunity to team teach a lesson in a 6th grade Social Studies class today. The teacher and I decided to use stations for the structure. The material was not new (ancient Egypt) so we didn’t have to worry about presenting new information. We wanted to give the students the opportunity to “play” with the content and review what they knew. 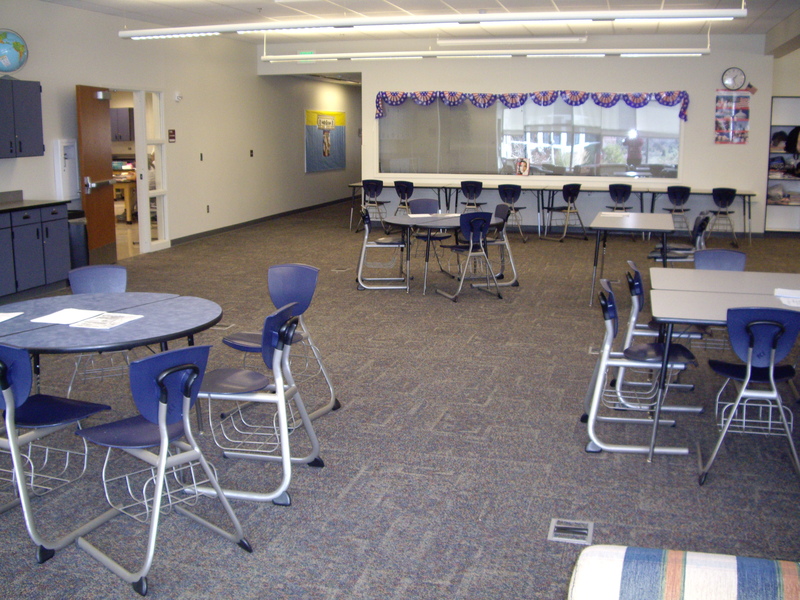 We developed three different station activities with four actual stations. One of the activities was longer and needed a little more time to complete. 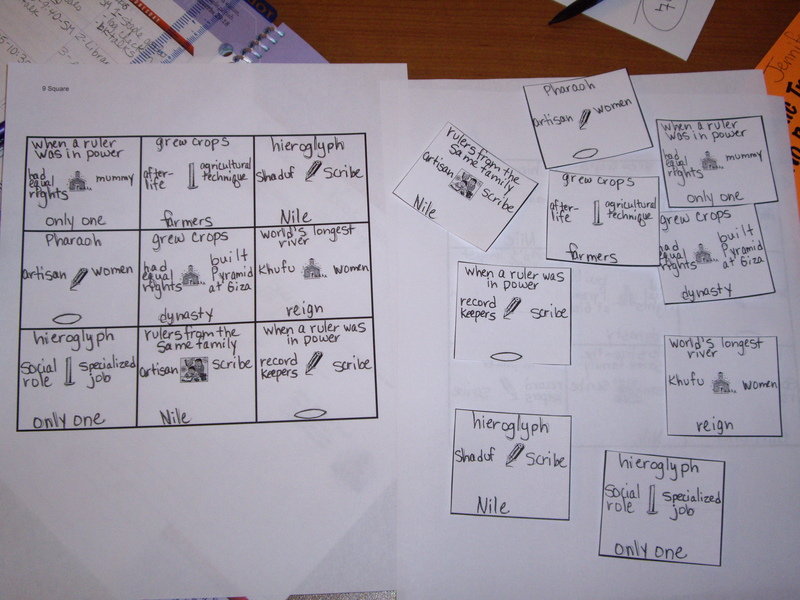 The activities were a 9 square game, decoding hieroglyphs, and creating a foldable using Egyptian cartoons. 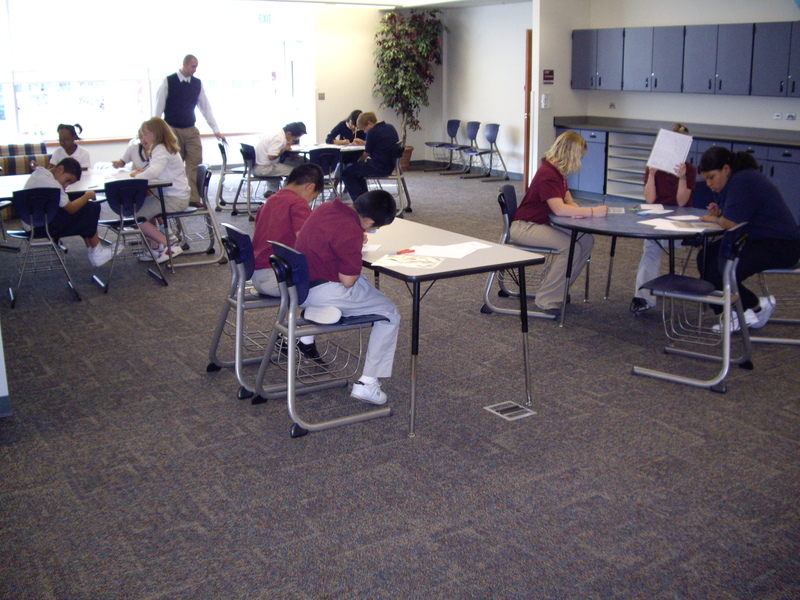 Each group would have about 11 minutes to complete a station based on the amount of time in the class. Student attempt at answering 9 square puzzle. 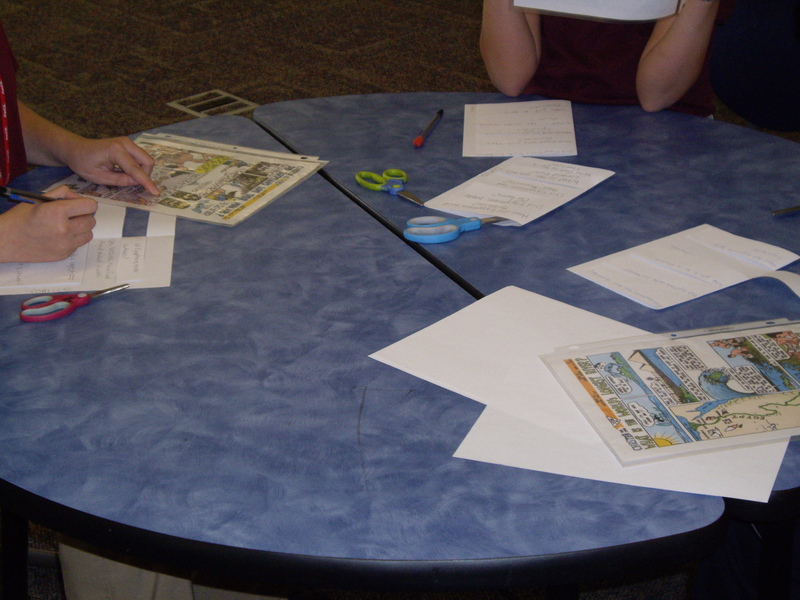 Creating foldable for Egyptian cartoons. When the students came into the classroom, I had four steps written on the board. The teacher wanted them to copy down the lesson objective and I wanted them to get out a blank sheet of paper. I learned a couple of new brain based strategies at the NMSA conference this past week. One of them that struck me was that we can hold about 10 things in our short term memory at a time. The speaker (Dr. Kagan) suggested that instead of a warm-up we have students write down everything that is going on in their brain when they first come into class (all the things that are bothering them, what they just learned, what they need to do after school, what they need to remember, ect). Sort of clear out the short term memory. I explained to the students why we were doing this and how I would not want the paper. I gave them one minute to write, but had to extend it as they kept making their list for over two minutes. I was amazed about how serious they took this activity. When they finished, I began explaining the stations and they seemed more focused. I will definitely use this activity again. I am thinking about having my students do this every day before class. I then began explaining the various stations. When I am explaining various activities, I explicitly state what they will and will not do. I show them the actual materials that they will use to complete the activities. I make sure that I have an example for them to follow at each station. I then took them out to their table in the pod area. They immediately began working. We made sure that we checked in with each station at the beginning of each rotation to make sure that they understood exactly what they needed to do. The level of engaged conversation was really incredible. The 9 square game was by far the most difficult activity, but students also had to work hard to find the information from the cartoons and decode the hieroglyphs. Out of two classes and almost 50 students, I had one student in one class that was not engaged. It turned out he just didn’t understand exactly what he needed to do and hadn’t asked another group member or a teacher. At the end of the class period, I had students return to the classroom and write one thing they learned and one question that they still had on the back of their foldable and turn it in. 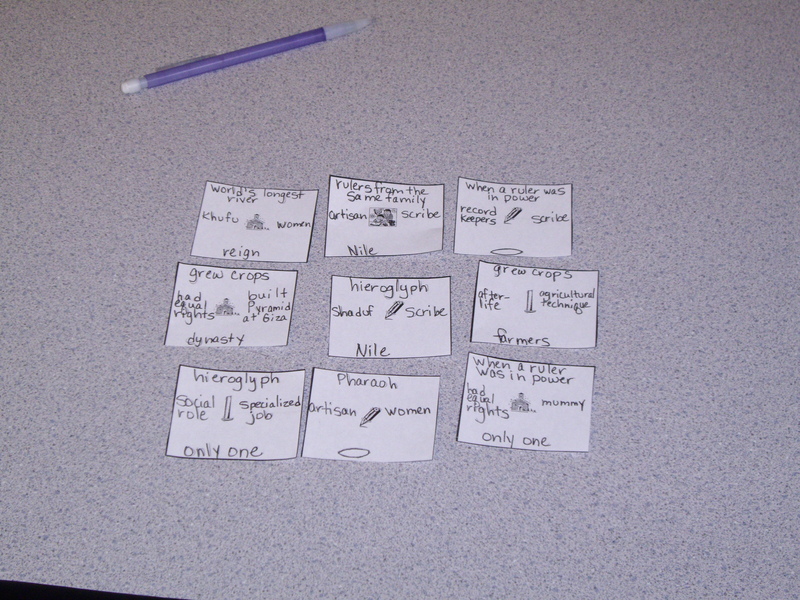 This was an exit card and a way for us to assess what they knew and what they were still struggling with. 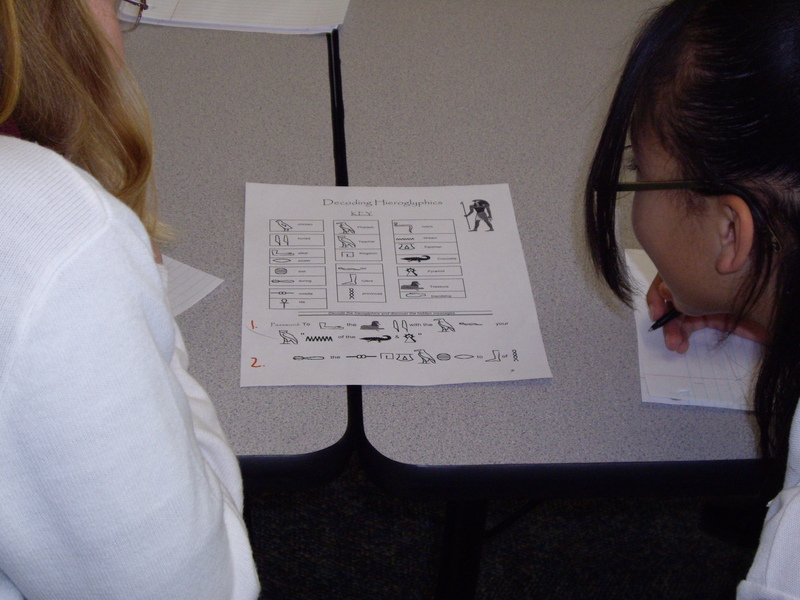 The foldable can also be used as a review for an assessment. As an additional exit ticket, I asked each student as they left to tell me one thing they learned. Overall, we were really pleased with the activity. 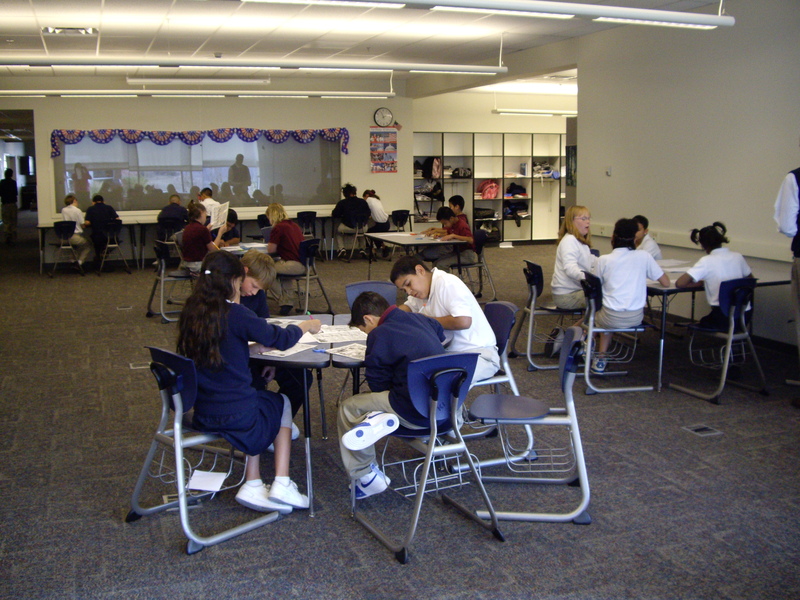 The students were engaged in meaningful dialog about the topic and were focused for the entire 45 minutes. This activity just reminded me how much I like stations. There is a lot of prep work, but when that is finished, you just facilitate during class periods. It is a great way to teach.